The Horn Books are piling up around here, so it's time to review one of these review journals. In this case, the May/June 2014 issue. 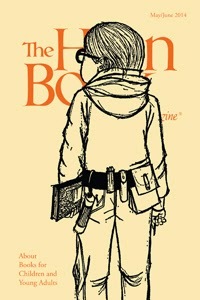 I didn't rush to get to May/June because it was dedicated to Harriet the Spy by Louise Fitzhugh. I am a member of that minority of people who are not Harriet fans. I didn't read it until I was well into adulthood, which may have been too late. I can't recall whether I read it aloud to my sons or not. What I do remember is reading the last page and thinking, What? I may have found the book overtly literary. But I'm talking a long time ago, so don't hold me to that. You can understand why my favorite article in this issue was Becoming a Book Detective by Cathryn M. Mercier. She wasn't crazy about Harriet, either. Plus, both Mercier and I read Reader's Digest Condensed Books when we were kids. Hmm. Is this nostalgia I am suddenly feeling? I have so little experience of it, I don't know. The Islands of Chaldea by Diana Wynne Jones, completed by Ursula Jones. Because I have a thing now for Diana Wynne Jones. We Were Liars by E. Lockhart. The reviewer calls this a "taut psychological mystery" and says "The ultimate reveal is shocking..." I like being shocked. Dreams of Gods & Monsters by Laini Taylor. I've read the first two books in this trilogy. This review explains why I wasn't crazy about book two. It moved from urban fantasy to high fantasy. I was hoping the end of that volume suggested that book three would be back to urban fantasy. But, no, reviewer says we'll be going on to "epic fantasy." I'll try it, anyway. The Boundless by Kenneth Oppel. I'm reading this now. Fighting Fire! : Ten of the Deadliest Fires in American History and How We Fought Them by Michael L. Cooper. Fire. History. Josephine: The Dazzling Life of Josephine Baker by Patricia Hruby Powell. Read it. The Pilot and the Little Prince: The Life of Antoine de Saint-Exupery by Peter Sis. I'm a Saint-Exupery groupie, and I've liked Peter Sis's work. Boundaries: How the Mason-Dixon Line Settled a Family Feud & Divided a Nation by Sally M. Walker. A feud. History.